Yesterday, I was reading a new book with Emma about how Ganesha, the Hindu God, broke his tusk trying to bite down on a jaw-breaker laddoo ​(Indian sweet) even though his friend, Mr. Mouse, warned him not to. Ganesha got so upset that he tried to throw his tusk at the moon. It didn’t reach. Instead, it hit an old man in the head. 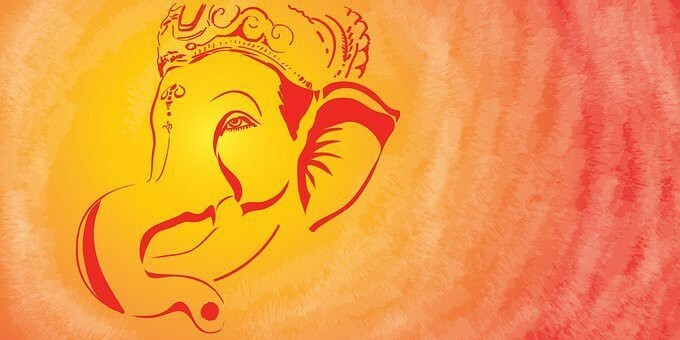 The old man was the poet Vyasa, and he brought the tusk back to Ganesha, who apologized. They introduced themselves and Vyasa told Ganesha that it was an amazing coincidence because he had been looking for him as he needed a scribe to help him to write a very long poem that no human could have managed with all of the pens in the world. Ganesha volunteered as he was not human and loved stories, but he didn’t know what to write with. Vyasa told him to try writing with his tusk. He did and they proceeded to write the poem together. He also quickly fell back in love with his tusk. Emma, who just turned three at the end of January, has a few things that fascinate her these days: excrement, animals and insects, books and extreme expressions of emotion (not necessarily in that order). She locked on to the fact that Ganesha was sad and upset when he broke his tusk and that he decided to throw it at the moon. She asked me a bunch of times what the moon did. I think she was checking to make sure that the moon was okay and to see if it was angry. Then, every time I got a little past the part when Ganesha threw his tusk, she turned to me and asked what happened with Ganesha. The adult in me wanted to continue with the story, but I decided not to. It wasn’t what Emma wanted or needed at that moment. So, as my wife can attest to, hearing me repeat the same part of the story over and over and over and over again, I just followed her lead and kept starting over and going back to this incident as many times as she wanted. Clearly, Emma was working through something about different emotions and how we act when we are upset. This morning, she was talking about something that happened last week when we were in the car about to go for dinner. I had reached my hand into our dog’s travel bag and got more than I bargained for when it met with a fresh pile of vomit. I instinctively yelled, because I was surprised and grossed out. That covered three of Emma’s fascinations in one fell swoop: animals, excrement (close enough anyway) and strong emotional reactions. Little kids process information and learn via repetition. We do as adults as well. That’s why they like to read the same books and ask the same questions. It’s the act of mastery and it’s comforting. Try and think about this the next time your child wants to slow down or go back and inquire about something or repeat something. Try to resist the urge to push them along to keep up with your pace and linger with them in the unknown. It can be hard to do. I know that I, for one, have succumbed to my impatience many times. It felt good to be aware of that this time though with Emma, which afforded me the opportunity to choose differently. The Love After Kids Relationship Toolkit is with the developer as I type, preparing it for publication on Teachable.com. There’s a bonus called Parent Focus featuring discussions between me and my wife, Deb, who’s also a therapist. Some of the topics that we talk about are how we deal with being stuck in certain roles as parents, our kids’ electronics usage, triggers for us as parents and dealing with differences. So keep an eye out. I’m hoping to launch on March 22. Originally published at www.huffingtonpost.com on February 22, 2017.